Butter wouldn't melt in her mouth, but this sweet-looking woman is responsible for the deaths of millions of people. Stalin could hardly have done better. 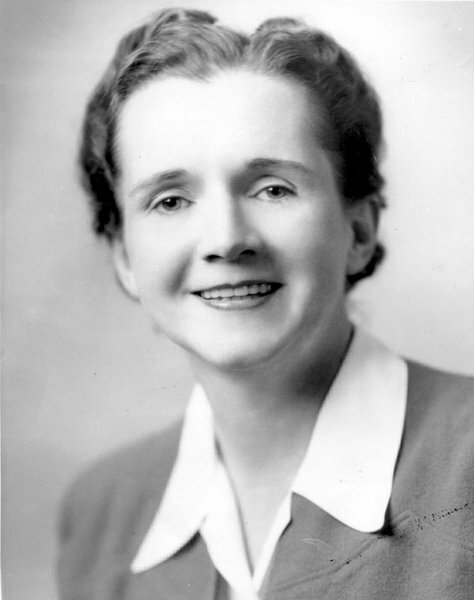 What is the black legacy of Rachel Carson and her duplicitous and hysterical screed of a book called "The Silent Spring"? Countless dead from malaria, with not one shred of evidence that DDT ever harmed a living thing other than a mosquito or a flea. Whacko environmentalism kills. DDT is making a comeback at last, but not before its banning brought catastrophic results. caused the world's deadliest infectious diseases such as typhus and malaria, which "may have killed half of all the people that ever lived" according to the World Health Organization, to make a deadly comeback that will soon threaten the United States and Europe again. "The resurgence of a disease that was almost eradicated 30 years ago is a case study in the danger of putting concern for nature above concern for people," said Nizam Ahmad, an analyst from Bangladesh that focuses on problems affecting developing countries. "It's worse than it was 50 years ago," said University of North Carolina at Chapel Hill malaria expert Dr. Robert Desowitz said. "Carson and those who joined her in the crusade against DDT have contributed to millions of preventable deaths. Used responsibly, DDT can be quite safe for man and the environment," Koenig said, summing up what many infectious disease experts believe. The discovery of DDT by scientist Paul Herman Muller, who was awarded the Nobel Prize in 1948, was originally hailed as a major public health success because DDT kills mosquitoes, lice and fleas, which are carriers for more than 20 serious infectious diseases like the bubonic plague, typhus, yellow fever, encephalitis and malaria. "To only a few chemicals does man owe as great a debt as to DDT. It is estimated that, in little more than two decades DDT has prevented 500 million human deaths, due to malaria, that would otherwise have been inevitable," a statement from the National Academy of Sciences said. Before DDT, infectious diseases spread like wildfire, leaving millions dead in their wake. During World War I, typhus epidemics killed 3 million Russians and millions elsewhere in European. But during World War II, before it was blacklisted by Carson and her crew, DDT saved millions of Allied troops from becoming ill and/or dying from infectious diseases such as malaria, typhus and the plague. Plus, DDT also saved the lives of recently liberated Nazi concentration camp survivors by killing off typhus-causing lice. Other reasons for DDT being hailed as a modern day miracle are legion. For starters, it is extremely cheap to produce, costing $1.44 to spray one house for a whole year. Alternative pesticides being pushed by the U.N. and environmentalists are 10 to 20 times more expensive. "DDT is the best insecticide we have today for controlling malaria," said malaria expert Dr. Donald Roberts of the Uniformed Services University of the Health Sciences in Bethesda, Md. "DDT is long-acting, the alternatives are not. DDT is cheap, the alternatives are not. End of story." Another reason DDT is such a blessing is that it enables developing countries to make significant economic progress, thanks to plunging infectious disease rates. According to the U.S. Center for Disease Control, "The unparalleled benefits stemming from [public health] programs [in developing countries] are due almost entirely to the use of DDT. DDT provides the only safe, economically feasible eradication measure available today [that helps to promote economic development." The nation of India provides an illustrative example. Before the World Health Organization began its worldwide malaria eradication program in the 1940s, India had more than 100 million cases of malaria and 2.5 million deaths annually; produced less than 25 million tons of wheat per year; was host to widespread starvation; and spent 60 percent of its GDP on malaria control. But by the '60s, India's malaria cases dropped to fewer than 100,000 reported cases, with less than 1,000 deaths. Thanks to this stability, India produced more than 100 million tons of wheat annually. But most importantly, DDT is also not hazardous to humans or the environment -- despite all the propaganda to the contrary. According to tests conducted by Dr. Philip Butler, director of the Fish and Wildlife Service's Sabine Island Research Laboratory, "92 percent of DDT and its metabolites disappear" from the environment after 38 days. (See Environmental Protection Agency's DDT hearings transcript, page 3,726.) Plus, humans have nothing to worry about small exposures to DDT. "DDT is so safe that no symptoms have been observed among the 130,000 spraymen or the 535 million inhabitants of sprayed houses [over the past 29 years of its existence]. No toxicity was observed in the wildlife of the countries participating in the malaria campaign," said the WHO director in 1969. "Therefore WHO has no grounds to abandon this chemical which has saved millions of lives, the discontinuation of which would result in thousands of human deaths and millions of illnesses. It has served at least 2 billion people in the world without costing a single human life by poisoning from DDT. The discontinuation of the use of DDT would be a disaster to world health." The only reason millions of lives are being lost to infectious disease is because of Carson's crusade against DDT in her 1962 doomsday book "Silent Spring." Carson predicted that pesticides -- namely DDT -- would cause "practically 100 percent" of the human population would be wiped out from a cancer epidemic after one more generation. This would come about because a race of super-insects, impervious to pesticides, would come about threatening U.S. farms. Desperate farmers then would triple the amount of pesticides they were using so they could stop the super-bugs from destroying their crops. As a result, DDT would eventually work its way up the food chain, killing off first the bugs, then the worms, then the birds (hence her title), the fish and finally mankind. Although this sounds pretty scary, all of this was mere speculation on Carson's part, based upon erroneous analysis of data (junk science). For example, Carson argued that the rise in cancer rates from 1940-1960 was proof that DDT was the cause because spraying began in 1940 and continued. However, if Carson would have looked at Center for Disease Control data from the 1900-1960, she would have noticed that her theory was way off the mark because cancer rates started to skyrocket in direct correlation to a surge of tobacco use. exposure, obesity, stress and lack of exercise. There are a few chemicals that are suspected to be carcinogenic. As far as I know there is no known association between DDT or any other insecticide and cancer. To categorize Carson's work as research is a big stretch. It was really just hysterical speculation." Despite the constant banshee call of environmentalists that DDT causes cancer -- their main reason for justifying a worldwide DDT ban -- there is no scientific data to back that up. the U.N. Environmental Program's alternative pesticides as a way to control malaria. But the mosquitoes quickly developed resistance to the new pesticides and malaria rates increased 1,000 percent. And despite UN threats to cut off funding for South Africa's public health programs, the nation started DDT again because its politicians could not stand idly by and allow millions of its citizens to become sickened and/or die from malaria. "They really tried to phase this stuff out, and had the budget to afford the alternatives," Attaran said. "[But if] South Africa can't get by without DDT, it's pretty much as if to say that nobody can." Edwards at first supported Carson but quickly changed his mind once he began checking her sources. What he discovered was not only did Carson rely upon "very unscientific sources," but she cited many of the same sources over and over again in order to make her book appear incontrovertible. Even more startling is that Edwards "found" many of Carson's statements based upon sound, scientific sources were actually -- his word -- "false." DDT, a notorious symbol of environmental degradation, is poised to make a comeback. International experts are touting the widely banned pesticide as a best bet to save millions of human lives threatened by malaria. The disease, which kills mostly children and pregnant women, is largely spread by mosquitoes. The overwhelming majority—90 percent—of malaria victims live in Africa, where the disease plagues both human and economic health (Africa facts, maps, more). This story illustrates the success of effective marketing ... and the depth of our society's gullibility. At least someone had the foresight, the opportunity and the balls to challenge this particular piece of propaganda. There is just so much propaganda out there, and so much of it has become almost sacred. How sad.